I bought my first rubber stamp, a gorgeous PSX image, about 25 years ago. I bought a pigment ink pad (didn’t know the difference between inks back then, and there were no books, no classes and no internet). When I used the stamp, I did everything wrong: loaded too much ink, didn’t press firmly or pressed too hard, rocked the stamp, etc. The results were so awful that I put the stamp away and never tried again. I did buy a few more stamps over the years but never had the courage to try them. About seven years ago, I took a beginner’s class at a stamp store, but the teacher moved too quickly and the people were rude, so I never went back. About four years ago, I bumped butts with a woman in the stamp aisle at A.C.Moore. She had been stamping for years. She talked me into attending a card-making class at the LSS. We became friends and I’ve been stamping ever since. I love almost every technique, but two of my favorites that I tend to use the most are using embossing powders and creating background papers. PSX is my all-time favorite (so sad PSX no longer exists), and I truly love the stamps from all of our elite vendors. Our vendors make beautiful stamps, and they are unique. Stampscapes, Magenta, Inkadinkado and many others make lovely stamps, too. Stampin Up! Makes some nice stamps. There are too many to name. Basically, I never met a rubber stamp that I didn’t want to bring home! Geishas always catch my eye, as do plants: cherry blossoms, ginkgo, bamboo. Oh, I can’t choose just one; I love all of my tools. But, my paper trimmer, heat tool, die-cutting machines and die, and embossing folders top the list. Pink. pink, pink, coral pink, and blues, greens, purples and black. I like to add something shiny or metallic and dimensional, such as coins, brads, crystals. And how did we stamp before pop-dots? Oh, no. Do I really have to pick just one? Okay, today it’s my BIGkick. Tomorrow it might be my trimmer or my Kai tiny trimmers or my Heat-It gun. Don’t be afraid to try new things, and if you’re not pleased with the results the first time, keep trying. I don’t know why I love the Oriental theme so much, but I have loved it since I was a child. Perhaps it’s the mystery, or because it’s exotic. I’ve never been to Japan, so I don’t know if rubberstamping is popular there, but that would be my first choice for finding ephemera and art supplies. I belong to Stampsmith, and periodically join local stamp clubs like Stampin Up!, or go to the stamp store classes. Rubberstamp Madness, VSN, Technique Junkies are all good. Some of the other magazines have become too weird in their quest for “art”. I hope I never see another crow, with one giant eye, sitting on someone’s head! (Grin.) That theme seems to have become a genre. My cards have been published in VSN a few times. I have only submitted to one other magazine and haven’t been published yet. I design cards, albums and altered items for a couple Internet sites. As a design team member for KandiCorp, I make items for them to showcase products at CHA and on HSN. My writing has been published. Nature, the work of other artists and all the gorgeous supplies. I have a degree in Studio Art and Art History. After teaching briefly in a public school, I started teaching at community centers and holding private classes. As a marketing professional, I worked in designing ads, brochures and other marketing materials. I love to use “found” objects! I have some wood scraps and a stem from a pumpkin that I love to use. Lotus root, potatoes and other root vegetables are fun to use. There are all kinds of goodies at the hardware stores. Pressing leaves and stems in my BIGkick makes nice background paper. OSA, of course! Splitcoaststampers, Stampscapes, and Amstamps are just a few good sites. No, I’m retired. But I might go back to work if I can find a job. I can’t support my habit without some more money! I’ve been divorced for almost 30 years, so I live alone in the frozen Northeast, in the foothills of the gorgeous Adirondack Mountains. Go Dacks!! I have very little family left, and most of them are still down South. January 2010 – Karlene-Frances S.
I love this stamp set from Stampin Up!. It’s Asian-inspired, with the branch of cherry blossoms, and the leaf stamp that resembles bamboo. Rubber stamping, masking with embossing powder, highlighting, shading, coloring, finding the center of a circle, matting. Papers Used: Stampin Up! Whisper White card stock; any pink card stock that matches your marker, and brown card stock. Inks Used: Staz-On black ink; Stampin Up! Apricot Appeal, Creamy Caramel, Close to Cocoa, Chocolate Chip; Marvy LePlume Markers in Bubble Gum Pink, Rose Pink, Pale Orange, Daffodil Yellow and Brown (Any brand of dye ink markers and ink pads that match will work.) Ranger Inkssentials Opaque Pen, white; VersaMarker Watermark Pen. Embellishment: One metallic gold cabachon, gold brad or crystal for center of large flower. Tools Used: Making Memories Circle Cutter (any circle cutter that can make a 5″ circle will work), paper piercing tool (or pin or needle); heat tool; sponge daubers or scraps of sponge. Other: Clear embossing powder, any brand. 1. Cut a 5” circle from Whisper White paper (this paper has a very nice finish—not glossy, but feels coated—so it’s very easy to blend colors). 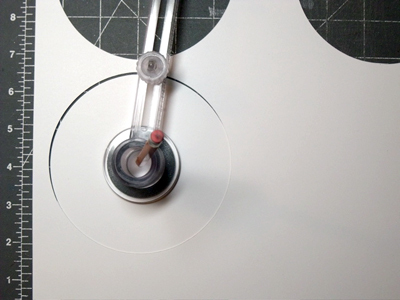 Before removing the circle cutter, make a light pencil mark in the center. 2. Pierce a tiny hole with piercer, needle, etc., in center. Erase pencil mark if still visible. 3. 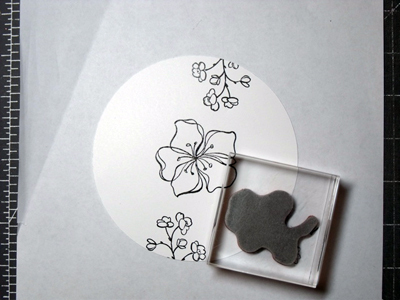 Stamp large blossom in center, using the tiny hole as a guide, using permanent black ink. 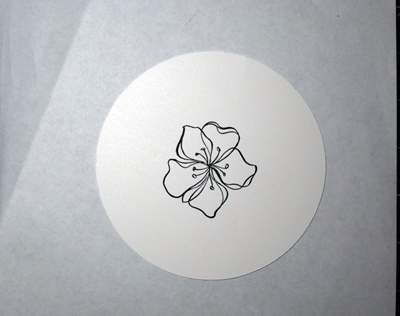 IMPORTANT: Try to stamp the center of the blossom directly over the tiny hole. 4. 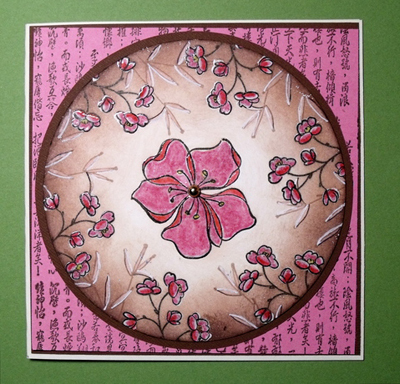 Stamp small blossoms around outside edge of circle, using permanent black ink. 5. 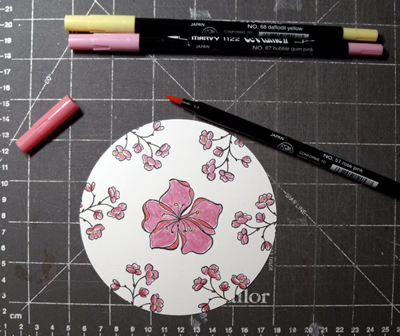 Color blossoms using markers: yellow for centers/stamens and lighter pink (Bubble Gum) for all blossoms. 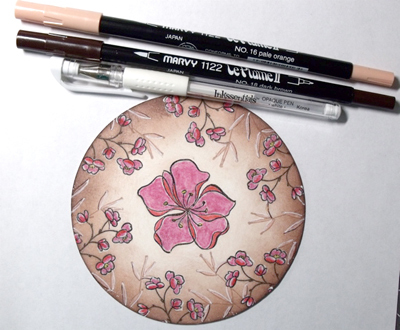 Go back with darker pink/coral (Rose Pink) marker and add shading to blossoms, using example as a guide. 6. With VersaMarker, cover flowers, a few at a time. 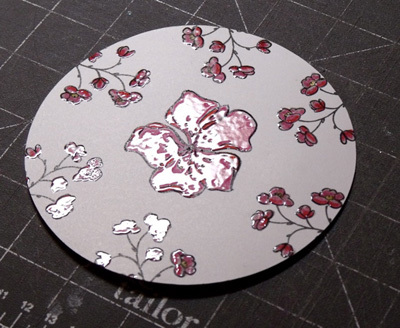 Sprinkle clear embossing on blossoms; shake off excess. 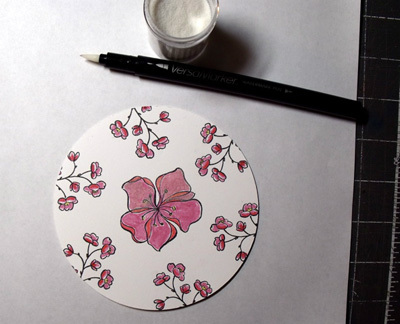 Go over a few more flowers and sprinkle clear embossing powder over those. Repeat until all blossoms are covered with embossing powder. 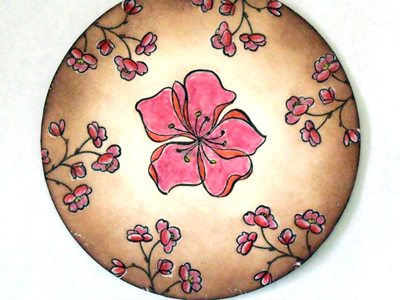 The top two petals of the large blossom in the next photo have been coated. 7. Heat with heat tool until powder turns shiny and clear. 8. 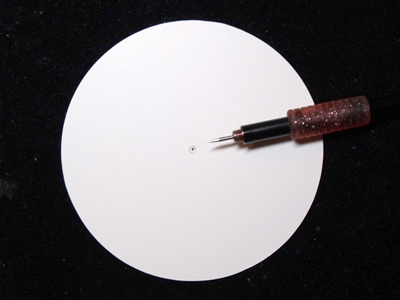 Using Apricot Appeal (or any peach or pale orange dye ink), sponge center of white circle. Go right over the large blossom with the sponge. 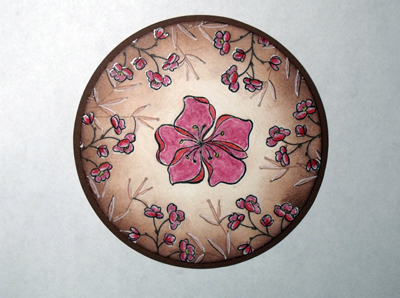 The embossed flowers will not absorb the ink, leaving the colors intact. 9. Sponge Creamy Caramel (or any tan dye ink) on the outside of the circle and work toward center flower, but don’t go all the way; leave some Apricot Appeal showing. 1. Sponge Close to Cocoa (or any medium brown dye ink) on outside edge and work inward, not covering all of the Creamy Caramel. 11. 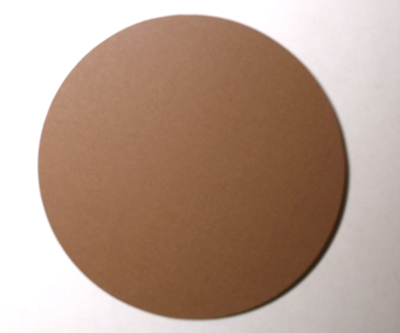 Edge circle with Chocolate Chip (or any dark brown dye ink). 12. Wipe off embossed flowers with dry paper towel. 14. Color leaves with Apricot Appeal or LePlume Pale Orange marker. 15. Shadows: Outline the bottoms of some of the leaves with the brown marker. 16. With opaque white pen, add highlights to the top/sides of some leaves. Set aside. 17. Cut brown circle mat slightly larger than the flower circle (I cut my mat at 5.25”). Adhere flower circle to brown circle. 18. Cut 5 1/8” square from pink card stock. 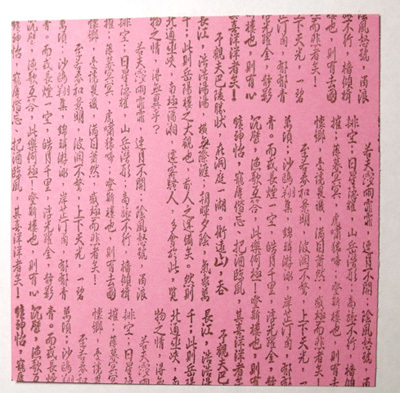 Using Chocolate Chip (or any dark brown ink) and a large stamp with small Kanji, bamboo or small flowers, etc., stamp background onto pink square. NOTE: This step is optional. You may leave the pink card stock plain. 19. Cut 5 1/4” square from brown card stock. Adhere pink square to brown one. 20. If using a brad for the center of the large flower, Pierce hole through all layers, insert brad and bend back flanges. Adhere flower circle to pink square. 21. If using a pearl or crystal for the center of large blossom, attach flower circle to pink square first. (It’s easier to apply adhesive without the bump in the center.) Then attach pearl or crystal to center of flower. 22. Adhere the layers to a 5 3/8” square ivory card. The only embellishment on this card is the center of the blossom, but you don’t need any more because the embossing gives sparkle and dimension. The green background is not part of the card.